This story is about a childhood memory of a haunted house. It’s a memory associated with my grandparents who lived in Davidson Avenue, Concord from about 1939 until their deaths in the 1960s. They were the best grandparents any kid could wish for. Between 1913 and 1924 my grandmother had given birth to five girls, with my mother being the youngest. Housing was in very short supply at the end of the war, so when my mum and her sister Jackie each married towards the end of 1945 they had no option but to continue living with their parents in Davidson Avenue for a while. It was only a small home and was then filled with my grandparents, two married daughters and their husbands, and at least one other unmarried daughter. Mum sitting on the front fence at home. Davidson Avenue is behind her. The crowding was about to get worse. Mum and Jackie each conceived their first child there. 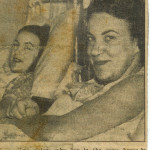 They both gave birth in 1947, amazingly on the same day within one hour of each other in adjacent beds of the same hospital. I was one of the babies, and the other was Richard, who I often called my twin cousin. As we grew up we loved staying over at our grandparents, and we would often be there together. Richard was more adventurous than I was, and was a bit of a handful, so we were often sent to play in the park nearby. There we would play on the swings and seesaws or toss a ball around, or just explore. A little further on from the park was a large run-down home on a big overgrown property. We knew it was out of bounds and had heard stories that it was haunted. There was also a story that a couple of kids had died on the property when they fell down a well. This may have been true, but equally it might just have been a story Gran or Grandpop told us so we would stay away from the place. Despite this I remember once visiting the property with Richard and exploring the grounds looking for the well. I can’t say for sure it was Richard’s idea, but it’s unlikely that it was mine. We were probably about 10 years of age at the time, which would make it about 1957. I do recall it was very scary. Had our grandparents found out we would have been in big trouble. 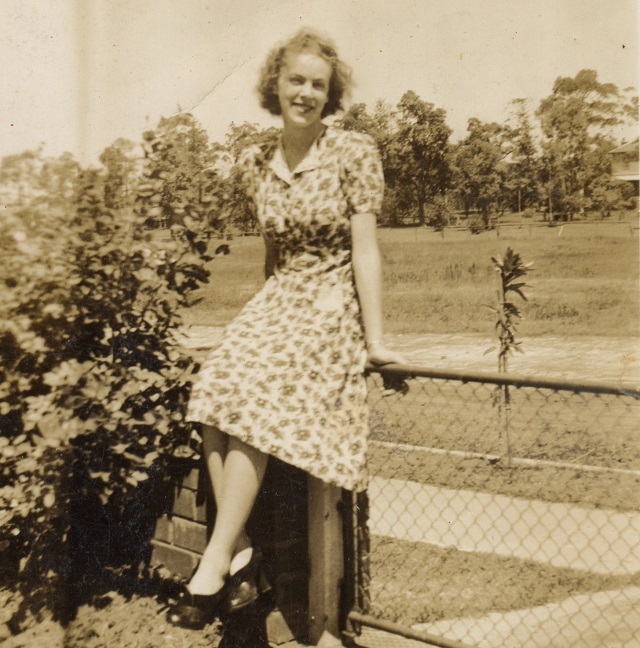 The memory of all this came flooding back a few days ago when I was looking at a photo of my dear departed mother sitting on the front fence of her parents’ home in Davidson Avenue around 1945. In the photo Davidson Avenue is still unpaved, and across the road is a bare paddock. Almost out-of-frame on the right there is a two-story home. I had a feeling this might have been the derelict home Richard and I had explored some 10 years after the photo had been taken, so I did some online research and quickly found a home called “Wellbank”, located on the corner of Wellbank and Flavelle Streets, just a little over 200 metres as the crow flies from my grandparents’ home, and in a direction that correlated with the home just visible in Mum’s photo. 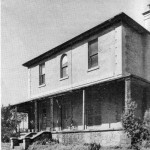 The estate was owned by John Flavelle (1816-1899), and he had built a two-story home on it around 1870. It was named “Wellbank” after his wife’s birthplace in Ireland. The original estate was quite large, extending from Correys Avenue to Arthur Street in Concord. It must have been subdivided in stages, as my grandparent’s home was on what was once part of the estate. In 1945 the Housing Commission compulsorily resumed what was left of the estate for post-war housing. This would have been the remaining portion on the southern side of Davidson Avenue that appears in the photo behind my mother. 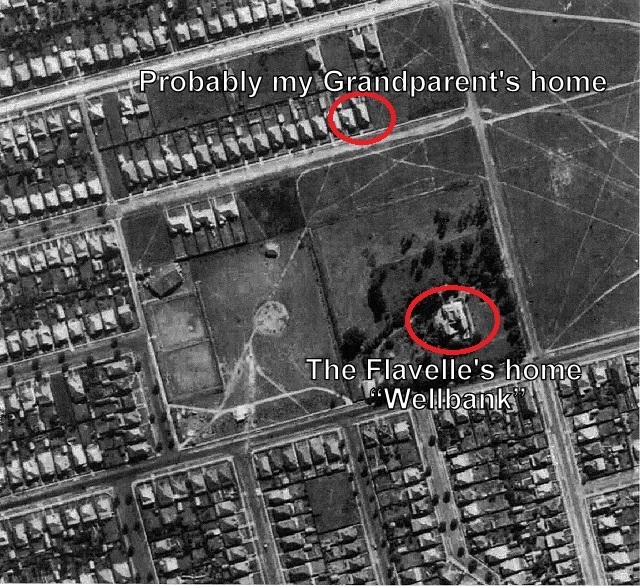 It excluded “Wellbank” and its immediate grounds, as Flavelle’s daughters Lucy (1869 – 1957) and Ida (1873 – 1955) continued living there until their deaths. I also found two aerial photographs of the area posted by Andy Brill on Flickr, one taken in 1943 and the other in 1951. 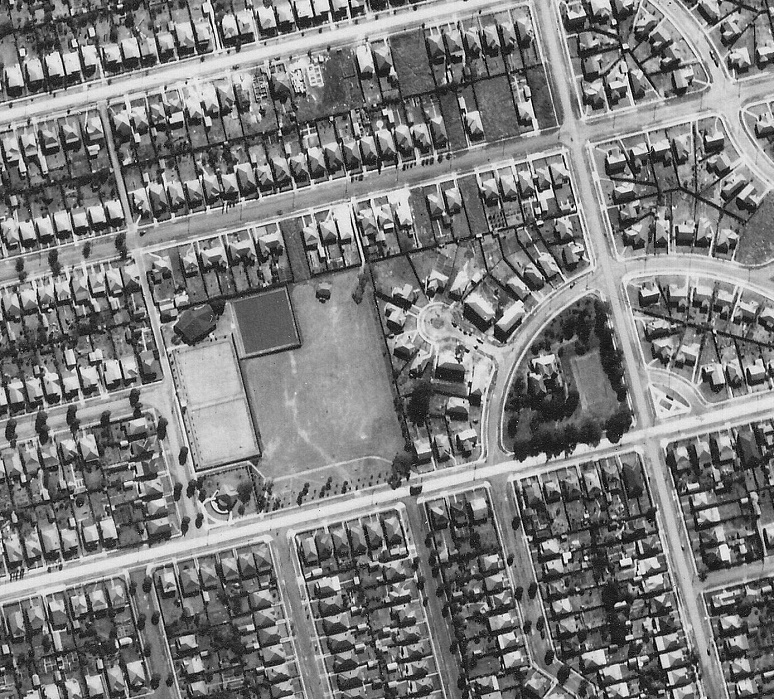 The one taken in 1943 shows homes on the northern side of Davidson Avenue, with my grandparent’s home probably the most easterly of them (circled in the photo). Between it and “Wellbank” there is just paddock and a few trees. This is consistent with the background in the photo of my Mum. 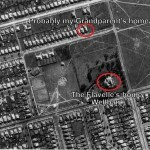 By comparison, the aerial photograph taken in 1951 shows the property reduced to about one acre, with an astonishing growth in housing surrounding “Wellbank”. The home was demolished in 1961 and Concord Council Chambers were built in its place. Checking the dates, it looks like Richard and I were exploring the property just about the time the eldest spinster died. After realising this, I couldn’t help but speculate on what their last years were like. Their parents were Irish immigrants who came to Australia around 1842 and were very successful. They had 13 children, succeeded in several business ventures, acquired the large estate in Concord and built a grand home. 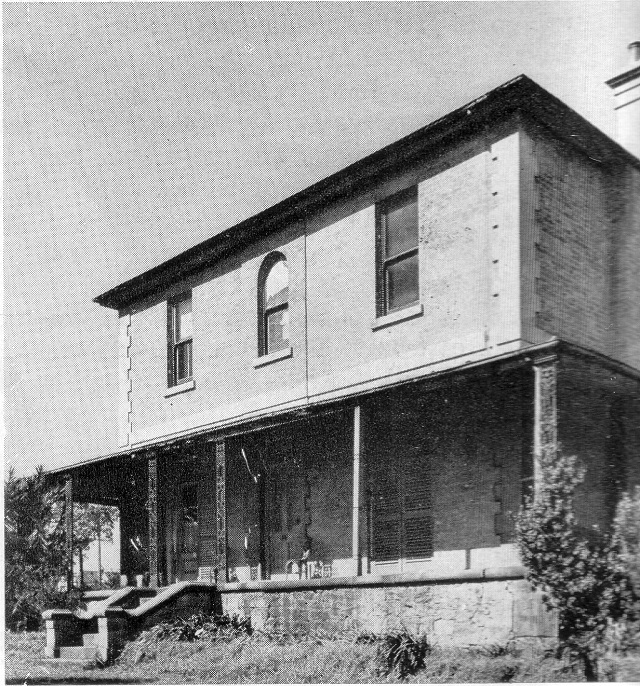 However during the life of the two eldest daughters their parents and 11 siblings died and most of the property was compulsorily acquired by the State following the war in 1945. 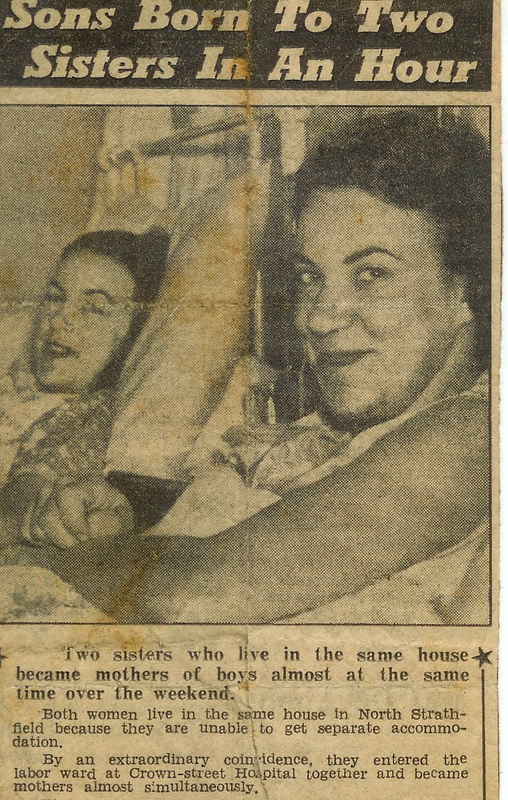 It’s likely they spent their last years as lonely women in a decaying home. In those years after the war, as new homes sprang up and encircled their diminished property, the spinsters must have been a topic of discussion in the suburb. Did they get help from their neighbours? Or did the stories told to my cousin and me about the house being haunted reflect a community view that they were strange old women who should not be approached? It gives me a strange feeling to realise that my cousin and I came very close to meeting the eldest spinster. She could even have been watching us from a cobwebbed window as we furtively searched for the well. Thanks to the Canada Bay Connections web site for some of the information in this post. The Trove web site has a lot more information about John Favelle. 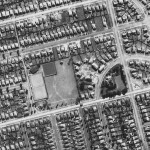 The 1943 aerial photo shows Concord Bowling Club under construction on the western side of “Wellbank”. My grandfather was a very keen bowler there, and also belonged to the club’s choir. I remember once going to a rehearsal with him and being greatly impressed. In my later life it became an ambition of mine to sing in a choir, and I’m pleased to say I’ve achieved that.